Steven started his athletic career at 5 years old competing in USA swimming. As a swimmer, he was awarded an NCAA division 1-A Scholarship at The University Of Pittsburgh. He qualified for and competed in three Junior National Championships, four National Championships, Big East Conference Championships and qualified for the 1996 Olympic Trials in the 100yd Butterfly with his time of 45:46. As a Crossfitter, Steven ranked 26th worldwide in the 2015 Masters Qualifier for the Reebok Crossfit Games. Steven has been training athletes of various levels for 25 years and holds several personal training certificates. 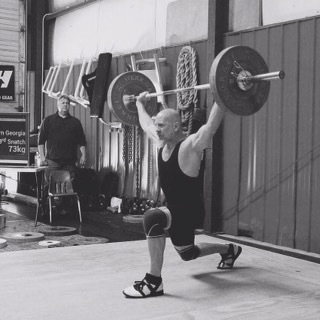 He started crossfitting as a way to embrace competition again and become a better, more rounded athlete and trainer. He loves how the functional movements in CF are combination of skills and drills to develop functional power and efficiency and maximize athleticism. And more importantly, that focusing on improving these skills, creates durability, longevity, and resistance to chronic disease. Steven received his CF Level I cert in June of 2011, CF Level II in November 2014. He also has certifications in CrossFit Gymnastics, Strong First Kettlebell SFG-1, Strong First Bodyweight, Functional Movement Screen FMS Level 2, USA Weightlifting USAW-1, Yoga RYT-200, and NASM PT. He has 5 accredited continuing education certifications scheduled for 2019. Steven had been a coach at CrossFit HD in Chamblee, GA since July 2011 where he had served as the head coach and programmer until opening his own gym, Crossfit Chattahoochee, in 2014. Steven can be reached at 404-216-8829.